Wowzer! Put the watercress away and grab a hunk of really, really sharp Cheddar cheese. This bread is not for sissies. 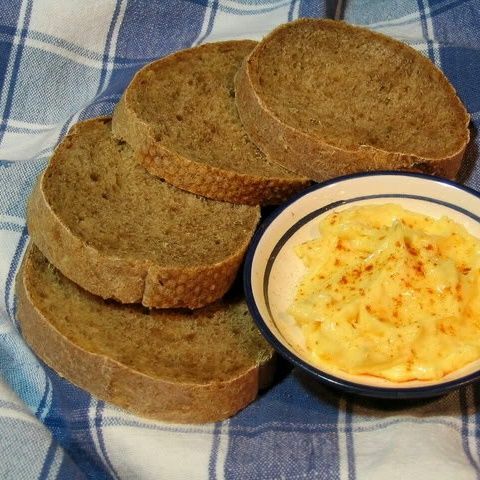 It's a guy's bread - bold, assertive and great for male gatherings when you have a horde to feed. This is a high-moisture bread, so it's really easy to make once you overcome resistance to the wet, sticky dough. If you're tired of the St. Patrick's day soda bread ritual you might want to give this bread a try. I found instructions for the bread on the Group Recipes site where it is called Black Velvet Guinness Rye Bread with Fennel Seeds. 1) Combine beer and water in a large bowl. Add yeast and stir until completely dissolved. 2) Add rye flour and 3 cups of white flour; whisk until thick batter forms. Cover and let rest until mixture begins to bubble, about 2 to 4 hours. 3) Stir in reserved 2-1/2 cups flour, salt and fennel seeds. Turn batter onto a lightly floured work surface. Knead roughly. Dough will remain sticky and loose despite your best efforts. I've found it best to repeatedly fold and throw it onto the work surface. I use about 1/2 cup additional flour for kneading. At this point you want to incorporate as much air as possible in the dough. The mass will begin to resemble a dough as you knead, but it will be very, very loose. 4) Return dough to bowl, cover and rest for another 45 minutes or so. 5) Turn dough onto work surface and divide into 3 equal pieces. Shape each piece into a ball and allow to rest for 5 minutes. 6) Lay dishtowels onto your work surface and lightly flour them. Re-shape dough balls into loaves and place on dishtowels to rise. I used Italian bread pans to hold my loaves because the dough was so loose I feared I'd have pita bread if it was not constrained. Let rise until double in size, about 1 to 2 hours. 7) Preheat oven to 450 degrees F.
8) Diagonally slash loaves with a razor blade. 9) Mist sides of oven with water from a spray bottle. 10) Slide loaves or pans into oven. Reduce heat to 425 degrees F after 5 minutes of cooking. Bake for another 25 minutes or until bottom of loaves sound hollow when tapped. Transfer to a wire rack to cool. Yield: 3 loaves. Cook's Note: This dough is very loose. I used Italian bread pans to contain the dough mass. Towel lined bread baskets can also be used. Mary- This bread is calling my name. It looks awesome and sounds fabbulous. You bake bread beautifully, each time!! I am in awe. Wish I had that skill. Oh Mary your bread looks great I hope I can get it made before someone consumes the Guinness. Can't wait to try just bought fennel seeds last week I will let you know how it goes. I do like a hearty bread that can hold its own when topped with a slice of a good aged cheese. I should make this for my husband - he is a Guinness fan. I love rye and fennel seeds so I am sure I would love it too. Sounds delicious. I'm going out to find some of Cahill's Irish Porter Cheddar this afternoon. That and a loaf of this bread would make a great meal on its own! I think there's room for both this Guinness bread and Irish Soda Bread at my table. What a great combo....I have 3 cans of Guiness in the fridge! Gals, this is a delicious bread but I'm not kidding when I say it's strong. Despite it being a guy's bread, I think I might like it! Susan, if you like strong flavors you'll like this bread. This looks awesome and intense! I bet a "lady" like me could eat the entire loaf of a "man" bread like this. This is a beautiful bread and I bet it tastes marvelous. Its on my list of must try's! I made it! The flavor is outrageously good. As you say, not for the faint of heart! Hi Susan. Glad you liked the bread. I saw this recipe on Susan's site and had to come right over, it sounds wonderful! I am definitely trying this one out. Natashya, I love it when you stop by. Remember if you decide to try the bread it is very strong. Not unpleasant, very different and easy to do.